A guardian is someone authorized by the Court to manage your affairs. A guardian may be appointed if you become unable to make sound decisions, handle your own resources or resist undue influence. A guardian may be a family member, a friend or, in some cases, a private professional guardian or the county public guardian. Unlike an agent with a durable power of attorney, because a guardianship removes some or all of your civil rights, the Court supervises a guardian in the handling of your affairs. You can name your own guardian in a written document ahead of time (a will, a power of attorney or an advance directive). That document may be considered by a judge if necessary. Even after a petition for guardianship has been filed, you can name your own guardian if you are physically and mentally able to do so. If someone seeks to have a guardian appointed for you, the law requires that you be notified, and you may oppose the guardianship in a court hearing with the help of any attorney if you request it. Yes, as described in the section “How can I help ensure that my affairs… on page 6, advance directives such as living wills, durable powers of attorney for health care and for handling your affairs can help avoid the more costly guardianship while preserving your civil rights. Yes, you need a Will if you want any control over who will inherit your property. Even if you own very little, a Will allows you to earmark a particular piece of jewelry or a cash gift for a person or charity of your choosing. You can express your funeral and burial wishes, and you name a “personal representative” (previously referred to as an “executor” or “executrix”) to carry out your wishes. The personal representative – who must be officially appointed by a judge – will collect and manage your assets, pay off debts and distribute your property. Your Will may be handwritten or a simple form Will; however, your Will must meet strict requirements to be valid. You should keep your Will up-to-date, reviewing it after significant life-changing circumstances, such as divorce or the death of a beneficiary. If you decide to rewrite your Will, do not make your changes on the original, as these changes will generally not satisfy the strict requirements to be valid. 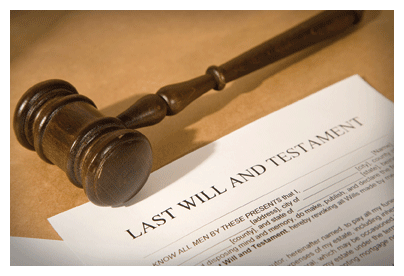 You can amend your Will with a separate legal document referred to as a codicil. You may want to consult an attorney before creating or changing such an important document. intestate succession. If you do not have a spouse, children or next of kin, your property will go to the state for educational purposes. How will my property be divided up after my death? If you have a valid Will, the personal representative named in your Will starts the process by filing a petition in court and seeking appointment as your personal representative. Once appointed, your personal representative will take charge of your assets, pay your debts and distribute the rest of your estate to your named beneficiaries. This process is supervised by the Court and is known as “probate.” If you do not have a valid Will, a relative or other interested person can start the probate process. Simpler procedures are available for transferring property to a spouse, children or next of kin or if the estate amounts to less than $100,000.00. No. Generally a Will does not control the distribution of life insurance proceeds, retirement plan assets, accounts with named beneficiaries, certain jointly owned assets, “transfer on death” or “pay on death” accounts and assets held in trust. A revocable living trust is a partial substitute for a Will. Assets which are conveyed into a revocable living trust are managed by a “trustee” or, if the trustee is unwilling or unable, by a “successor trustee” during your lifetime and after death as you have provided in the trust. The person establishing the trust (known as the “grantor” or “settlor”) usually names himself or herself as trustee and manages the trust assets. Unless you become incompetent, you can revoke or change a revocable living trust at any time during your lifetime. The advantages of a living trust include (a) the assets transferred into the trust do not go through probate, (b) you can designate a successor trustee to manage the trust assets in the event of any incapacity and (c) the distribution process after death often takes less time than the probate process. A revocable living trust does not remove all need for a Will. Generally, you will still need or want a Will – known as a “pour-over Will” – to cover any assets that were not included (intentionally or by omission) in the trust. Will my Estate be taxed after my death? The answer to this question depends on your circumstances. Under present federal law, property left to your spouse or a charity will not be subject to “estate tax.” The portion of the estate that is left to anyone else – even your children – will be taxed if your assets total over $3.5 million in 2009. In 2010, unless Congress passes an extension or a new federal law, the estate tax is repealed, and in 2011 will revert to $1 million. Under present federal law, you can also give away as much as $13,000 a year to each of your children or to anyone else without incurring a federal “gift tax.” In addition, you could pay your grandchildren’s college tuition or medical insurance (or anyone’s tuition or medical bills, for that matter) free of gift tax – but only if the payments are made directly to the educational institution or medical provider. (See IRS Form 709.) For information on estate tax and other gift tax exemptions, contact an estate planning attorney or call the Internal Revenue Service.